Long before there was Team Edward and Team Jacob there was Team Dylan and Team Brandon. The eternal conundrum of bad boy versus good boy has played out in pop culture, cultivating dedicated fan followings. Girls of all ages are smitten by their favorite on-screen rivals, developing unnatural obsessions that are never truly forgotten. Cult classic Beverly Hills 90210 started the trend, and for those of us who fell in love with the primetime soap, our admiration continues today. 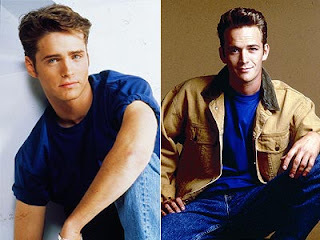 Complete opposites from day one, rebellious Dylan (Luke Perry) and angelic Brandon (Jason Priestley) remained the best of friends. Dylan was balanced out by his mama's boy best friend, and viewers watched as the original bromance bloomed. It wasn't until the later seasons when the friendship ended thanks to a joint love for Kelly Taylor, but fans were already firmly placed in their team camps. For all you Brandon fans, I get it. He's perfect on paper - good looks, good reputation, good grades and good family. But why fall for the everyman when you can have a piece of Dylan McKay. The bad boy is the one girls want, but will try to never fall for. No one wants the drama that comes along with a rebellious man, and that's why we reserve our obsession for Hollywood characters. Don't you agree, ladies? So, today, on 9-02-10 day, I want to know - Team Dylan or Team Brandon?